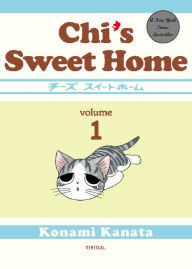 This is a minireview of the graphic novel series Chi's Sweet Home, which was absolutely adorable. It's about a "newborn" kitten who loses her mommy and is found and adopted by a nice family. The family has many troubles with Chi because they are not allowed to have a kitten in their apartment. The story covers her adventures growing up for what I would assume is several months (though she doesn't seem to grow much in size). She has many kitten-like adventures, and makes some good kitty friends along the way. The little boy in the family is also adorable, though his age is indeterminate. The art for this book was so, so cute. And the story was "realistic" in the sense that the author clearly knows a lot about how kittens act. It reminded me a lot of my own kittens. Especially the one I found lost in a street gutter a few years ago. She was so forlorn and scared! And she was always chewing through cords. Anyway, if you like graphic novels for kids, this is a great one to pick up.